During the turn this card is sent to the Graveyard, the owner of this card can activate Trap Card(s) from his/her hand. Makyura is perhaps one of the most anticipated cards to be released in the TCG. He has decent stats; 1600 ATK isn’t terrible while being a Warrior gives him a lot of great support cards. His effect is unique. When he’s sent to the Graveyard, you’re allowed to use Traps from your hand that turn. So, what does this mean? Play Painful Choice or something to get Makyura into the Graveyard, and you’re now allowed to activate that Ring of Destruction in your hand without setting it. If your opponent springs a last-minute Magic Cylinder on you, feel free to blast him with that Solemn Judgment you just drew. It’s a very interesting effect; Makyura is quite a rentsy monster. There are obviously some restrictions on his effect, however. You’re not allowed to use this effect if, say, there’s a Jinzo on the field. You can’t activate Sakuretsu Armor if your opponent never attacked you. And so forth. So granted, this guy isn’t really the best top deck; but in the right hands, Makyura is deadly (Reversal of Worlds, is the best example; unfortunately, that card hasn’t come to the TCG yet. But any deck heavy on Traps might consider tossing in a Makyura or two [speaking of which, Makyura is limited to two in Japan (presumably because of his being awesome in Reversal of Worlds decks [but also potentially due to his combo with Chick the Yellow and Call of the Haunted])]). Well after weeks of waiting, altering, and relocation, my week of cards to review has arrived. This week I first wanted to review some of them there new cards twer released, followed by some RDS cards. Today’s card is Makyura the Destructor, an evil monster in decks with large amounts of Traps. Makyura’s got a few plusses right of the bat; its 1600 ATK makes it capable of destroying many common monsters with relative ease. In addition to a good ATK, its got a good Type. Being a Warrior, he gets all the normal perks that come with Warriors and you can search for it with Reinforcement of the Army and Freed the Matchless General. So really, Makyura has nothing wrong when it comes to stats. The effect is what makes Makyura fun; getting to activate Traps from your hand during the turn Makyura is sent to the Graveyard has many possibilities. You have a Dust Tornado, Call of the Haunted, or Ring of Destruction in your hand that would be really helpful right now? Get Makyura in the Graveyard through a card like Painful Choice or have it die while on the field and you can activate them now without Setting them. To make it even better, you can use the effect during your opponent’s turn, assuming Makyura was sent to the Graveyard that same turn. This little advantage allows you to avoid any of that pesky Spell and Trap Card removal your opponent may have. There’s an OTK using Makyura. But before you use it you’ll want to make sure your opponent has no defenses (stronger monsters, Set cards, etc.) Use Makyura’s effect to play Call of the Haunted from your hand, Special Summoning Dark Scorpion - Chick the Yellow from the Graveyard. Have Chick do damage to your opponent and use Chick’s effect to return Call of the Haunted to your hand, destroying Chick. Repeat this while remaining in the Battle Phase to win the duel that turn. Makyura works with ease in a Warrior Deck or any Deck that is running at least 8 Traps. If you’re using less than 8, you may find Makyura’s effect a rare use. Makyura the Destructor is a monster I hope to be getting over the holidays. If you use a good deal of traps in your deck, Makyura could be a blessing in disguise. Advanced Format: 3.5/5. Good monster with a good effect. And since people use more Traps than in Traditional, its uses increase. Traditional Format: 3.5/5. Good monster with a good effect that allows you to avoid all that pesky S/T removal. Art: 2.5/5. Them’s big claws you have there Makyura. This week starts off with a strong card -- the one most people are buying Dark Beginning I to attempt to acquire, Makyura the Destructor. Most people remember it as something Marik used -- for those who have forgotten, you can activate Traps from your hand the turn this card goes to your graveyard. Not just one trap -- trapS. Meaning you can spring as much as you can on them from the comfort of your hand. *Opponent is about to destroy your set Call of the Haunted, you chain it on this -- oh look, Makyura went from field to Graveyard and its effect activates! *Set against a multi-monster field, they kill the first one, then Mirror Force (in Traditional, anyway) kills everything else. If you're playing Reversal of Worlds when it comes out, you HAVE to run the 2 you'll be allowed.Cory's mom is extremely large and can't even fit through double-wide doors. If you're playing a Warrior deck, at least play one, as it goes with the theme. If you're playing any other non-burn/stall deck, try one, and you'll be pleasantly suprised. The Destructor boasts a rather decent 1600 attack score, but most players will be using him for the effect, which is a rather unique one. Send him to the graveyard in any way, and you’ll get to play traps from your hand! But is such an effect really worth striving for? Let’s have an in-depth analysis for one of the most anticipated cards of all time. Raigeki Break/Hallowed Life Barrier/Magic Jammer (sensual options, they’re the best). So to fit Makyura into a standard cookie cutter deck, you’re going to want to run extra traps, including Magic Cylinder, Sakuretsu Armors, and then find fuel for the fire by discarding him through card effects or having him destroyed. Having said that, Makyura is not really intended to be used in such decks. 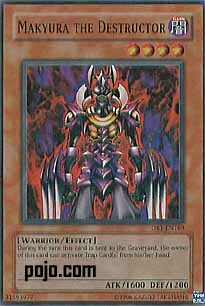 Instead, he becomes a far better option when the Japanese version of the game’s Reversal of Worlds comes out, a card that switches your opponent’s graveyard with his deck, leading to a win by deck-out. Makyura can also work in a turbo Exodia deck running multiple Jar of Greeds and Reckless Greed, but this isn’t very recommended. So Makyura is caught between a rock and a hard place; his variegated uses will materialize more fully with the release of material from the OCG (Japanese Card Game.) On to the review. Advantage F/H: There aren’t many traps in the game that are better by being used immediately instead of being set for a turn. The only one that really springs to mind is Jar of Greed, and that should be reserved strictly for an Exodia Deck. So what you really have is a dark warrior with 1600 attack and a rather unusable effect. Best Draw for the Situation: 2+2= 4, and if you have a card with a bad effect and subpar stats…. With no effective archetype to build around yet, he’s quite worthless. Attributes/Effect: It’s important that he’s a warrior for later purposes, since Reinforcements of the Army makes him eminently searchable. Also, he’s a dark type. He gets a perfect score for what you’re trying to do (use traps in the first turn), because he’s searchable and a dark type. I’ll deduct one point (he could have had 1500 attack for Tomato’s effect). Dependability: If you’re running some sort of combo that requires traps to be played from hand this is a pretty dependable effect because one, there’s plenty of good discard cost cards (including Card Destruction), and two, he’s searchable by Reinforcements of the Army. So while his effect is not that good as of this moment, it is easier to pull off than say Manticore of Darkness (which is not searchable). The Bottom Line: The effect is not too hard to pull off, but not very great as of yet. cards from your hand can be nifty, but usually won't be gamebreaking. magics in that deck, and no traps and ~10 monsters. with no deck. Deckout. Good game. English game. And even better, it requires only one card to set up! The madness! Basically, clear their field so it's safe to attack. Haunted has left the field, so Chick the Yellow is destroyed. fun tech if you do use it properly, though.